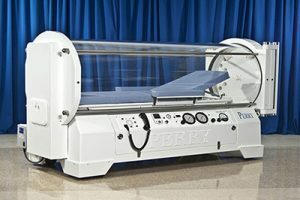 HBOT is the administration of 100% oxygen in a pressurised environment that exerts up to three times normal atmospheric pressure. The regular air we breathe contains 21% oxygen. When there is poor or restricted blood flow, red blood cells lose their ability to transfer oxygen. The combination of increasing pressure and the breathing of 100 % oxygen causes large amounts of plasma to be diffused from the plasma into tissues, cells, organs, brain cells and bone structures.